Tidewater shares enjoyed a bump last month after new regulations were proposed for the offshore drilling industry. Here's what you need to know. 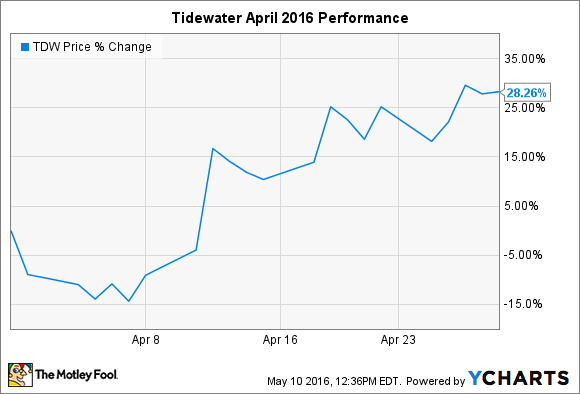 What: Shares of Tidewater (NYSE:TDW) rose 28.3% in April, after posting an 18.8% gain in March, as offshore drilling industry stocks continued to claw their way out of lows set in recent months. But investors shouldn't call this a comeback just yet. So what: Difficult times for the oil and gas sector have hit offshore drilling especially hard, which has had disastrous consequences for Tidewater investors: One year ago today, shares of Tidewater were trading for nearly $30 per share. Despite continuing losses, optimism is mounting for the company, although shares have moved sideways as investors consider the potential implications of newly proposed regulations for offshore drilling that were announced in mid-April. The draft rules, which oil companies widely oppose, will place extra safety requirements on exploratory and new wells drilled offshore in an effort to prevent another Deepwater Horizon fiasco. The American Petroleum Institute estimates (link opens a PDF) that the draft rules would increase offshore drilling costs by $31.8 billion over the next 10 years -- not what companies struggling in this niche industry want to hear. The potentially good news for Tidewater is that one-third of the increased costs to the industry are expected to come from modifications to existing wells. So even if oil companies drill fewer offshore wells, the company could be kept busy providing its fleet to well operators looking to bring their wells into compliance. Now what: Tidewater's balance sheet is relatively healthy, but continuing losses will make this a tricky investment for the foreseeable future. There's no timeline for reinstating the dividend, and the newly proposed regulations have a way to go before being finalized. For now, it may be best to stay away from offshore drilling stocks.